Finally! An effective multi-action formula for smoother, firmer & radiant skin around your eyes! "When it comes to the eyes- the windows to the soul and revealer of your age; we’re loving the "High Performance Eye Lifting & Line Smoothing Anti-Fatigue" Eye Patches that we recently discovered from Y.E.S. Young Essential Skincare. In less time than it takes to drink a latte, you can plump up the skin around your eyes, giving them a boost while leaving you’re your skin silky smooth, soft, and the skin calmer. 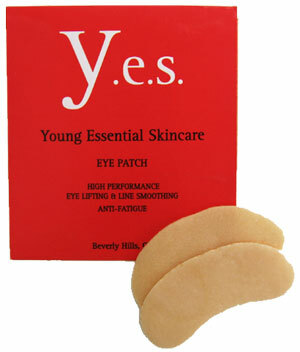 These fabulous little patches alleviate puffiness, dark circles, and fine lines- and they do it in a super cool way. Simply place them on your eyes and in no time they dissolve- along with your wrinkles!" - Jason Salzenstein - Edge San Francisco. "The eye patches are simple and effective, easy and convenient to throw in your weekend bag. These are the perfect beauty accessory for everyone."